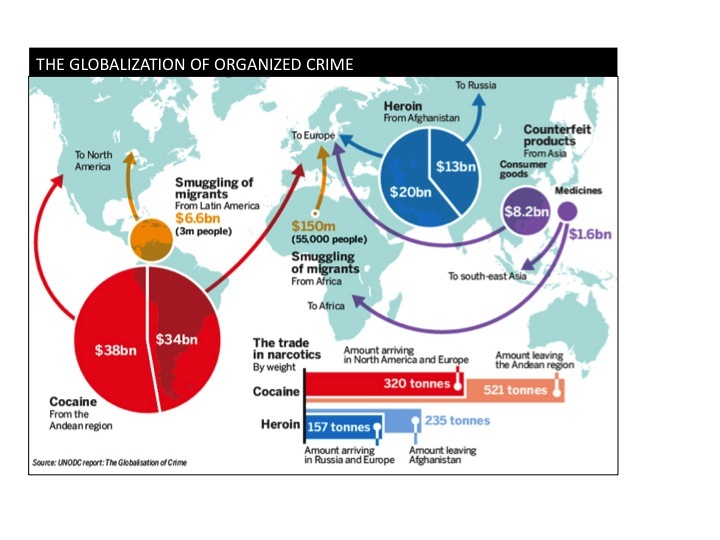 Today, the criminal market spans the planet: illicit goods are sourced from one continent, trafficked across another and marketed in a third.Transnational crime has become a threat to peace and development, even to the sovereignty of nations," warned the head of UNODC. "Criminals use weapons and violence, but also money and bribes to buy elections, politicians and power - even the military. Among the findings :Europe is the highest-value regional heroin market (US$ 20 billion), while the Russian Federation is now the single largest national heroin consumer in the world (70 tons). Countries that grow most of the world's illicit drugs, like Afghanistan (opium) and Colombia (coca), receive the most attention and criticism. Yet, most drug-related profits are made in the destination (rich) countries. For example, out of a global market of perhaps US$ 55 billion for Afghan heroin, only about 5 per cent (US$ 2.3 billion) goes to Afghan farmers, traders and insurgents. North American cocaine market is shrinking because of lower demand and greater law enforcement, which in turn has generated a turf war among trafficking gangs, particularly in Mexico, and new drug routes. Regarding human trafficking and the smuggling of migrants an estimated 140,000 people become victims of trafficking for purposes of sexual exploitation in Europe alone, generating a gross annual income of US$ 3 billion for their exploiters. The two most prominent flows for smuggling migrants are from Africa to Europe and from Latin America to the United States. Between 2.5 million and 3 million migrants are smuggled from Latin America to the United States every year, generating US$ 6.6 billion for smugglers. The report shows how illegal exploitation of natural resources and the trafficking in wildlife from Africa and South-East Asia are disrupting fragile ecosystems and driving species to extinction. UNODC estimates that illicit wood products imported from Asia to the European Union and China were worth some US$ 2.5 billion in 2009. Regarding cybercrime, more than 1.5 million people a year suffer the theft of their identity for an economic loss estimated at US$ 1billion, and that cybercrime is endangering the security of nations: power grids, air traffic and nuclear installations have been penetrated. UNODC makes a number of suggestions on how to deal with the threats posed by the globalization of crime, including "disrupting the market forces" behind these illicit trades and global responses on the basis of the United Nations Convention against Transnational Organized Crime (also known as the Palermo Convention), which was adopted in 2000. "Crime has internationalized faster than law enforcement and world governance,The Palermo Convention was created precisely to generate an international response to these transnational threats, but is often neglected," he said. "Governments that are serious about tackling the globalization of crime should spur the nations that are lagging behind in the implementation of the Convention," said the head of UNODC. "When States fail to deliver public services and security, criminals fill the vacuum," said Mr. Costa. "Reaching the Millennium Development Goals would be an effective antidote to crime, that in itself is an obstacle to development," he added. He also called for greater attention to criminal justice in peace building and peacekeeping operations. "Since crime creates instability, peace is the best way of containing crime," he said.